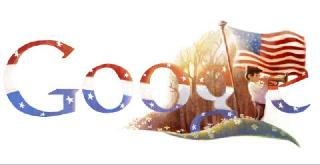 Google is celebrating veterans day by his beautiful Google's doodle on Google search page. It is very beautiful with Google's name logo written in American Flag's Tricolour. An United States flag and a boy representing army band is also present on the end of Google name. Veterans Day is an official holiday of United States to honour armed service veterans. It is observed on November 11th as federal holiday. women who died while serving.